What is the secret of talent? How do we unlock it? In this groundbreaking work, journalist and New York Times bestselling author Daniel Coyle provides parents, teachers, coaches, businesspeople--and everyone else--with tools they can use to maximize potential in themselves and others. Whether you're coaching soccer or teaching a child to play the piano, writing a novel or trying to improve your golf swing, this revolutionary book shows you how to grow talent by tapping into a newly discovered brain mechanism. Drawing on cutting-edge neurology and firsthand research gathered on journeys to nine of the world's talent hotbeds--from the baseball fields of the Caribbean to a classical-music academy in upstate New York--Coyle identifies the three key elements that will allow you to develop your gifts and optimize your performance in sports, art, music, math, or just about anything. - Deep Practice Everyone knows that practice is a key to success. What everyone doesn't know is that specific kinds of practice can increase skill up to ten times faster than conventional practice. - Ignition We all need a little motivation to get started. But what separates truly high achievers from the rest of the pack? A higher level of commitment--call it passion--born out of our deepest unconscious desires and triggered by certain primal cues. Understanding how these signals work can help you ignite passion and catalyze skill development. - Master Coaching What are the secrets of the world's most effective teachers, trainers, and coaches? Discover the four virtues that enable these "talent whisperers" to fuel passion, inspire deep practice, and bring out the best in their students. These three elements work together within your brain to form myelin, a microscopic neural substance that adds vast amounts of speed and accuracy to your movements and thoughts. Scientists have discovered that myelin might just be the holy grail: the foundation of all forms of greatness, from Michelangelo's to Michael Jordan's. The good news about myelin is that it isn't fixed at birth; to the contrary, it grows, and like anything that grows, it can be cultivated and nourished. 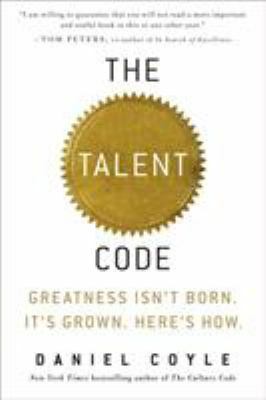 Combining revelatory analysis with illuminating examples of regular people who have achieved greatness, this book will not only change the way you think about talent, but equip you to reach your own highest potential.